The sallet afforded excellent protection and the wide vision slit with extended lower lip protected the face whilst allowing for better ventilation and airflow than earlier great helms with breathing holes. 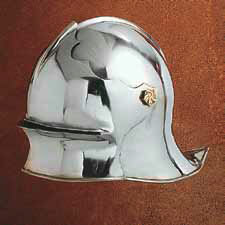 Sallets often had a hinged face visor that could be lifted when not necessary. Sallets worn by light infantry and archers often had no visor at all. The origin of the sallet seems to have been in Italy where the term celata is first recorded in an inventory of the arms and armour of the Gonzaga family dated to 1407. In essence the earliest sallets were a variant of the bascinet. To increase protection to the face and neck, the sides of the helmet were drawn forward at the bottom to cover the cheeks and chin and the rear was curved out into a flange to protect the neck. This page was last modified on 4 May 2014, at 17:58.